The Nashville Predators have returned home following their game 5 win against the Ducks in the Western Conference Final. That win in Anaheim, California on Saturday night helped the Preds regain the series lead. The series now stands at 3-2, and game 6 has been set for 7 p.m. Monday at Bridgestone Arena. Hundreds of fans showed up on Sunday to show their love and support for the team. 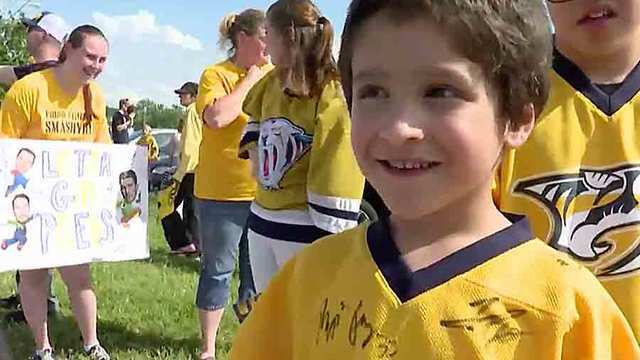 The crowd began gathering more than an hour before the Predators landed in Nashville. The team's plane landed at the airport around 3:30 p.m. Sunday. The fans chanted "Let's go Preds!" and "We want the cup!" as they held up signs. Many of the signs were homemade and full of creativity as fans hope the Preds defeat the Ducks once again Monday night. 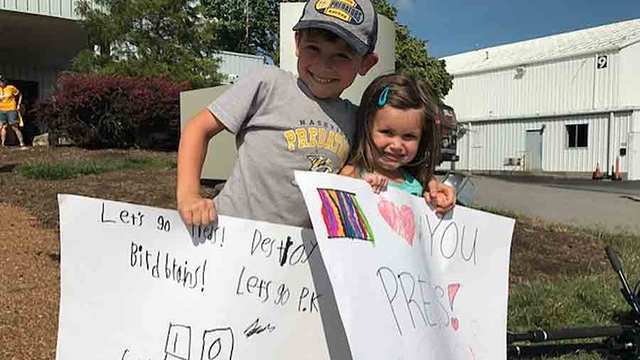 Some of the smallest fans showed their pride through their own creative signs. One very lucky little boy had multiple players stop to sign his jersey, which quickly filled up! 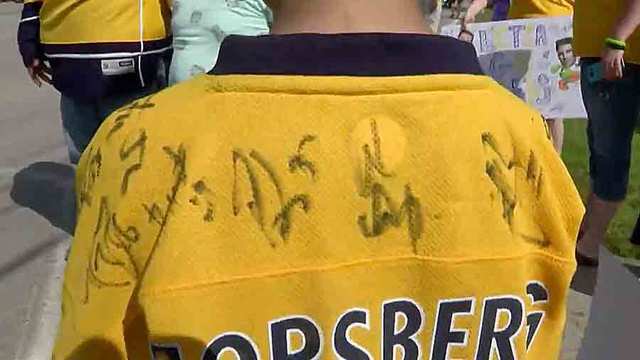 When asked about the signatures, the 7-year-old said it was cool and made him feel happy. We asked him how many he got, and he said, "I do not know cause... lots!" This has been the Preds first time playing in the Western Conference Final, and one more win will send them to their first ever appearance in the Stanley Cup Final. Fans at the airport on Sunday said they hope the team brings the Stanley Cup to Nashville. That would take a total of five more wins from the Preds, and fans said they believe this team can do it. For more information on game 5, click here . See the team's triumphant return to Nashville on Sunday in the video below.